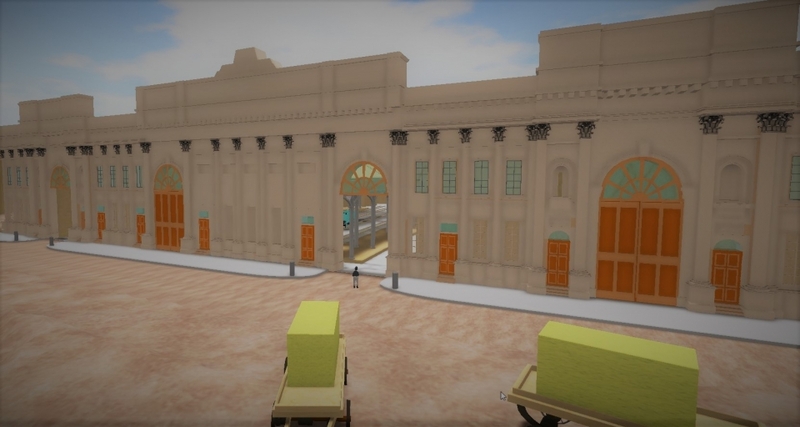 The iconic Lime Street railway station underwent a major upgrade in 2018 and was closed for long periods as a result. Looking back, however, the station itself first opened on August 15th 1836 as the city centre terminus of the Liverpool & Manchester Railway (L&MR). This had started services almost six years previously as arguably the first modern railway. The Victorian era was still one year in the future but railway development was so successful that the station was subject to its first upgrade just 10 years later in 1846. This took some five years to complete by which time the L&MR had merged into the London & North Western Railway Company (LNWR). 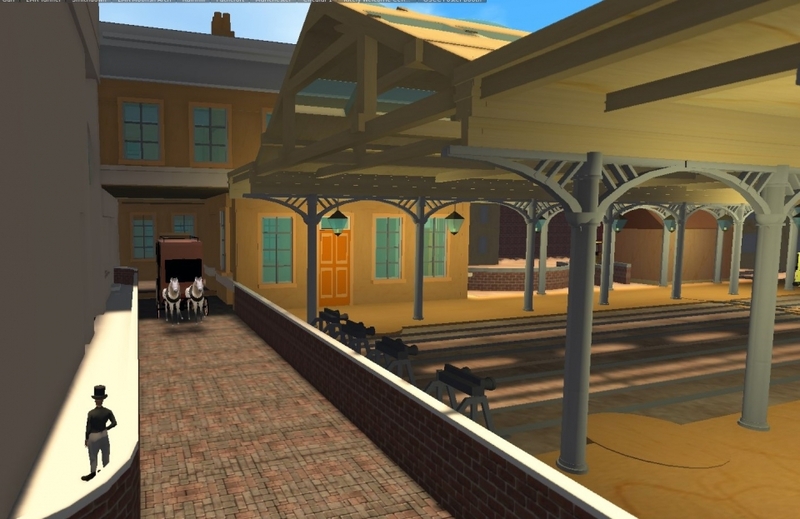 The upgrade is famed for its innovative iron roof, the first of its kind, but I thought it would be interesting to look back at the original 1836 station and to do an OpenSim build both of the station and the surrounding streets with a view to better understanding its context. As ever, much conjecture ensues. The original station was built on the site of a cattle market bounded by Great (now Lord) Nelson Street, Duncan (now Hotham) Street, Gloucester Street (the present main entrance) as well as Lime Street itself. The 2.2 acre area was actually smaller than the core of the Crown Street site (2.9 acre) which was, however, an inconvenient (and, for the company, costly) 20 minute carriage ride away. Other changes included relocation of the L&MR carriageworks from Crown Street and subsequently closure of the nearby Dale Street booking office. Fig: Foster's facade seen from the New Haymarket. Lord Nelson Street would be to the left and Gloucester Street to the right of this view. Only two of the four large gates were actually used in 1836; the road coach entrance is on the far left and the exit on the right where the avatar is standing. The gates are shown with fanlights as in Herdman's later painting but in the build are presently too low relative to the height of the facade. Getting trains to the centre of the burgeoning town without disrupting street traffic was problematic and the answer, as at Crown Street, was to tunnel from Edge Hill where the present-day station was now established (architects: Haigh & Franklin). It was the completion of the new tunnel and necessary machinery to haul trains up the gradient to Edge Hill that determined the opening date in 1836. At this time carriages minus locomotive ran under gravity into Lime Street. The station was not finished when it opened, some buildings being extended subsequently, not least to accommodate the Grand Junction Railway (GJR) which commenced operations from Lime Street to Birmingham the following year. The Lime Street site was originally a cattle market owned by the Corporation and negotiations for its acquisition were somewhat protracted, the Corporation ultimately agreeing that work could commence subject to a 4% interest charge (minutes of the Board of Directors [BoD], 6th May 1833). On 4th March 1833 chairman Charles Lawrence was directed by the Board to offer £8500 for the site, the value determined by surveyor John Stewart, partner in architect John Foster Jnr's practice. The Corporation returned with an offer of £3 per sq yd plus buildings (BoD, 18 Mar 1833) and the sale was finally agreed at £9000 for the site and buildings but excluding the weighing machine (BoD, 14 Oct 1833). Attempts by the company to sell off the old cattle market buildings for recycling of materials generated little interest in terms of revenue and so the company itself demolished the buildings. Contractors for the "coachmakers' workshops" were provided with recycled bricks and slates for construction purposes, all other materials to be new (BoD, 24 Aug 1835). Although the Land Committee had been asked to commence planning the station on 2 Dec 1833, It was not until 20 April 1835 that Foster presented multiple plans for the facade to the Board, their choice being Elevation No. 2. This was made of Welsh limestone backed with brick. Grey marble was considered as an alternative but was ruled out as it would have doubled the cost (BoD, 24 Aug 1835). Foster presented final plans for the facade and general offices to the Board for approval on 13 Jul 1835. Contracts for building the facade and entrance were awarded to George Robinson of Toxteth Park (£4500; BoD, 17 Aug 1835) although Robinson later appealed for losses of £500 accrued during construction (BoD, 5 June 1837. The contract for company offices "immediately behind" the facade was awarded at the same meeting to John Kilshaw for £1795 (architect not specified). 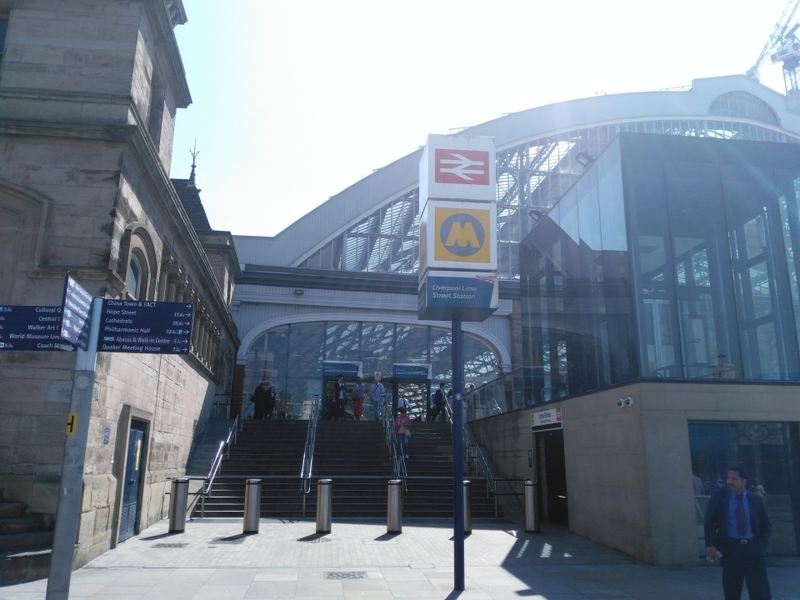 The decision to open Lime Street station was taken by the Board on 25 July 1836. There was remarkably little fanfare, the minute simply reading: "ORDERED that the new station in Lime Street be opened for general business on Monday the 15th August". The new station at the other end of the tunnel opened on the same day, of course, but nearby Wavertree Lane, now redundant, lingered on for a further week before it closed. In fact, the Lime Street facade was only finished by May the following year (BoD, 8 May 1837). Even then a contract was agreed with James Munro of New Scotland Road for the final external touches, iron palisades and gates for a total of £148. Developments inside the station continued with plans submitted for further offices at the corner of Lime Street and Gloucester Street. Instructions to collect the £2000 contribution promised by the Corporation toward building costs were made at this meeting but somewhat surprisingly had to be repeated a year later (BoD, 19 July 1838). At the same meeting Joseph Franklin submitted his claim for £191 to cover the new arrival station at Manchester and the Lime Street coach house and general offices of the Grand Junction Railway Company. Almost as if Franklin's claim had jogged their collective memory, the Board determined to pay Foster a somewhat arbitrary £200 fee for his contribution to Lime Street, Foster apparently having submitted no claim. He was similarly offhand after the opening with regard to the Moorish Arch and was ultimately given silver plate which he preferred to money. Readily available information on the first Lime Street station is in surprisingly short supply. The visual record is dominated by John Foster Jnr's imposing facade, neoclassical as ever but with its arches more Roman than Greek. The company had managed to persuade the council to make a contribution towards what was probably the first example of monumental station architecture, one year ahead of Birmingham Curzon Street and two of the Euston Arch in London. Through depictions of Foster's arches we get a limited glimpse of the station beyond that is complemented by the textual outline in Whishaw's guide of 1840 and the detail of the Town Plan of 1850. Foster's facade on Lime Street ran between Lord Nelson Street and Gloucester Street. At the time it looked onto a fairly mundane scene rather than the magnificent St George's Hall shown in Herdman's 1857 painting (much of Herdman's work in the area derives from this decade). Aquatints by Kelper and lithographs by Lizary and Barrow are more contemporaneous. Fig: The view from the station exit gate. The barracks (former asylum) and St John's Church can be seen in the distance. The former infirmary garden is behind the wall or fence. The station Goods Office is on the left. The area had formerly been the location of the first infirmary but this had since moved to Brownlow Street and only vestiges remained. Still standing, however, was the former lunatic asylum, now converted to barracks for the use of troops in transit to and from Ireland. The asylum aligned roughly with the rear of present-day St George's Hall and behind it in turn was St John's Church. The area between the asylum and station was formerly landscaped gardens for the infirmary but was probably now somewhat unkempt if Eglington's view of 1818 (but painted later) is anything to go by. The painting also shows the New Haymarket at the top of St John's Lane although there is a right-angle corner to the asylum wall rather than the sweeping curve of Gage's map of 1835. This was on an L&MR omnibus route from Dale Street headed for the London Road and then Crown Street. It is possible that the longer but more gradual route was chosen to avoid the steep incline of Shaw's Brow (now William Brown Street). The haymarket was relocated in 1841, in part to the former Botanic Gardens site near Crown Street which in turn had relocated to Edge Lane. The project that led to the construction of St George's Hall (with the twin functions of concert room and assize court) only started in 1836 with the design competiton opening in 1839. The building itself was completed in 1854, its architect, Elmes, having died tragically young in 1847. As with the adjacent station, much of the construction was carried out by the Liverpool firm run by Samuel Holmes although Holmes complained in his memoir that he never cleared a profit on St. George's and could not therefore look on it with any pleasure. Fig: In 2018 Gloucester Street has long been subsumed into the main station entrance following the later addition of a second train shed extending the station to Skelhorne Street. The buildings on the Lime Street frontage beyond Gloucester Street were retained for some time and formed an interesting contrast to Alfred Waterhouse's North Western Hotel (seen on the left) which replaced Foster's facade in 1871. At the time the station opened, what is now William Brown Street with its museum, library and art gallery was, at least on the north side, a continuous row of houses and commercial concerns running up to Islington Market. The area had been notable in the 18th century for its potteries but these were likely derelict by 1836. Fig: Shaw's Brow (north side). The windmills were somewhat less bulky than those shown and there were houses and businesses behind the street frontage. Likewise Islington Market failed to thrive once St John's Market opened nearby and it subsequently moved to Gill Street; the Wellington monument and Steble fountain stand on its former site. As we curve round back to the station in 1836 we pass the Legs of Man public house, Garner's livery stable and the carriageworks of Newby & Varty before returning to the station facade. Fig: View from London Road. The public house, livery stable and carriageworks to the left of the station are now the site of the Liverpool Empire Theatre. Here we move deeper into the realms of conjecture. The station facade is both a puzzle and possibly the key to its solution. Cunningham & Holme are normally credited with the train shed and Foster with both the facade and overall project management. It is likely, however, that the station encompassed many other unattributed buildings, perhaps most notably the Treasurer's Office (presumably variously the company or general offices in the BoD minutes), the Goods (or Parcels) Office and the Booking Office. Given Foster's significant commitments elsewhere (e.g. the new Customs House/Post Office), it seems not unlikely that some of these were designed by Cunningham & Holme as well as Haigh & Franklin. However, if, as proposed, they used Foster's facade as their western wall (although the Treasurer's Office did not initially extend that far), there would clearly need to be some collaboration with Foster. The satirical magazine The Porcupine (part 3) on the other hand refers in 1865 to the original facade as being a "sham" simply hiding a number of low station-buildings (as revealed by the fenestrations, i.e. windows). Clearly this would in part be true even if the offices extended to or were immediately adjacent to the facade as they extended across only part of it. Fig: A highly conjectural view of the station seen from the rear from above Hotham Street. Buildings (or parts thereof) highlighted in red were completed subsequent to the opening and appear in the 1850 Town Plan. Conversely, the carriageworks may have been largely demolished by this time. Of the four arched gates, only two were functional, the road carriage entrance being on the left according to Whishaw who states that the corresponding exit is on the right, implying a connecting roadway between the two. As a road carriage enters therefore there is a choice, either drive straight on or turn sharp right. Turning right led to the standard drop-off route for cabmen and perhaps this route went "through" the Booking Office where travellers could dismount and enter under cover, effectively a porte cochere. The vehicle would then proceed past the tracks on the left towards the third building, the Goods Office, turning hard right again just before reaching it and exiting the station. Fig: Behind the facade (largely conjectural). 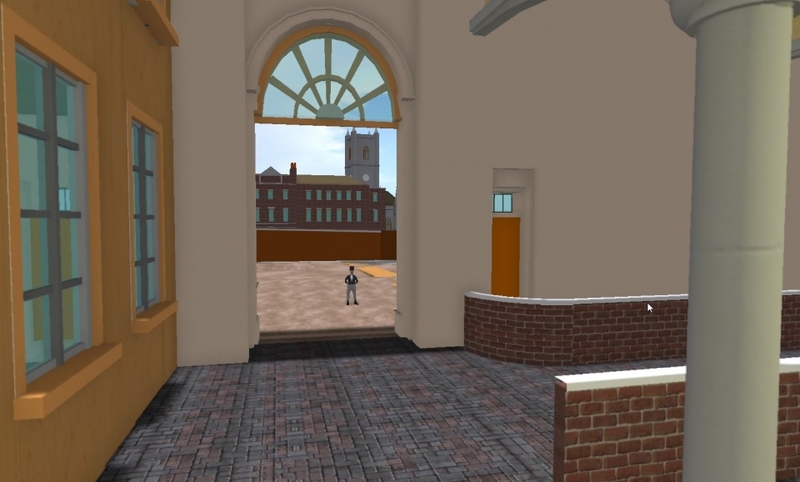 There are transverse routes for cabs and pedestrians running adjacent to the platforms with the Booking Office in the background and the Treasurer's Office visible through the arch. These routes had likely disappeared by 1850 with the need to accommodate longer trains. Carrying straight on between the Treasurer's Office and Booking Office leads to what appears to be a turning circle and ramp onto the platform. I suspect this was the way first class passengers with their own carriage would arrive whether taking the carriage with them or not. Horses accompanying carriages could also be loaded at Lime Street though horses without carriages had to go to Edge Hill. The higher status of passengers using this route is notionally reflected in an additional, more ornate door into the Booking Office. Whishaw also specifies a route for passengers on foot via a passageway from a door onto the Haymarket (logically there would also be one at the other end). This would presumably take you alongside the connecting roadway and, after crossing it, into the Booking Office. The Booking Office had a floor area of about 300 m^2, probably similar to the main passenger building at Crown Street but shorter and wider. As Whishaw points out, however, the facility was shared with the Grand Junction Railway and would have included separate ladies waiting rooms, possibly individual ones for the two classes. Of course, there are now two floors available with the Treasurer's department under Henry Booth housed separately. Even so, I would suggest that the building extended at first floor level to the adjacent glazed area of the facade to form the porte cochere. According to Thomas (1980), the two (very low) platforms were originally intended to separate the classes so it is possible that Kelper's 1836 print shows a first class train on the lefthand platform, its passengers presently in the waiting-rooms, and second-class passengers awaiting their train on the right, possibly with limited access to waiting-rooms. It is also possible that the people shown are waiting to greet the train due on that platform. This was common practice although, as an angry letter to the Mercury newspaper makes plain, it was not a right accorded to those awaiting arrival of third class passengers on GJR services so there was likely some access control by policemen. Fig: View of the (simplified) train shed looking towards the tunnel under Hotham Street. The Booking Office is on the left, the ramp and putative carriageworks beyond. The station is lit by gas. In 1850 an excursion train from the North Staffordshire Railway comprising 22 carriages and three brake units failed to stop on the descent into Lime Street (braking may have been insufficient as the carriages were much heavier than the LNWR equivalent). Accordingly the carriages collided with the station "end wall", presumably the internal surface of the facade, damaging the stone and carving up the flagging and paving on recoil. The buffers had recently been removed. Some 50 passengers were injured though, fortunately, none seriously. If one assumes that the carriages were of the order of 20 feet in length, the train would have extended well beyond the early platform and into what had previously been the tunnel but was probably now cut back as part of the 1846-1851 upgrade, Hotham Street being carried over the yard on a viaduct. The reasons for removal of the buffers are not discussed in the official report but clearly the pressure to accommodate longer trains may have been an issue. Accidents caused by failure to brake adequately occurred periodically at the early Lime Street station, the first such incident being reported in 1838. As already mentioned, by 1851 cabs dropping-off passengers probably exited via the previously unused gate second from the left, again presumably to free up space for longer trains. There is one significant difference between the map and Kelper's print, namely the buildings on the left, one group aligned with Hotham Street (which passes in the distance from left to right) and the other with Lord Nelson Street. My guess would be that the former were either part of the cattle market or the nucleus of the carriage works managed by the Worsdells which relocated from Crown Street. Carriage repair and manufacture moved to Crewe in 1843 so the land was available for redevelopment before 1850. Whishaw asserts in 1840 that "the carriage-wharf is conveniently placed opposite the arrival-gate in the Haymarket, and near to the entrance to the carriage-department." The Haymarket "arrival-gate" in this context presumably refers to the entrance for road carriages on Lime Street arguably some distance from the New Haymarket itself. 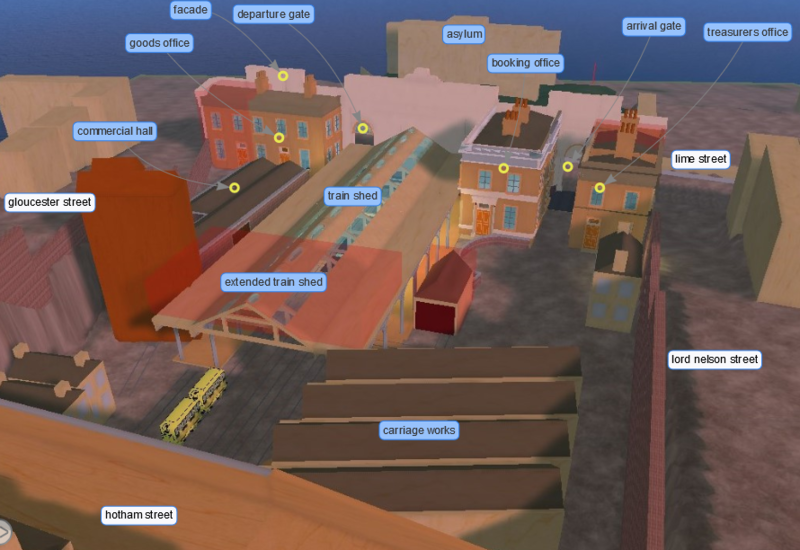 The map shows a large bay here beyond the Booking Office (and presumably before the carriageworks) with what might be part of a loading ramp. There is also a siding with four turnplates that runs alongside Hotham Street that might have served the buildings in Kelper's print and subsequently the four carriage-ways that ran through the carriageworks missing from both print (unbuilt) and map (demolished). Whishaw mentions that the buildings of the carriageworks were two storeys in height with trapdoors communicating between levels. The building on Lord Nelson Street may have been for the station superintendent or similar. According to Thomas, goods traffic into Lime Street was initially not permitted but presumably a small-scale service was subsequently authorised for the benefit of local businesses. The role of the Goods Office at Lime Street may have been related to this activity or it may have served to coordinate goods-related activities at Park Lane and Crown Street in addition to Lime Street itself. Lizary's lithograph shows a substantial warehouse on Gloucester Street which was presumably related to the station. The 1850 map also shows a large building connected by a siding and termed the Commercial Hall. This appears in a Herdman sketch of Gloucester Street alongside the iron train shed of the first upgrade and is similarly barrel-shaped. Further buildings adjacent to Hotham Street may have been for the use of railway workers, including train crew staying overnight. The build is in a very early stage and is based on a very small number of sources. While Herdman's sketches are an invaluable part of Liverpool's visual record, they often date to two decades after the station's opening and have to be interpreted with due care. Pigot's Directory for 1837 suggests, for example, that there were no inns or hotels on Shaw's Brow at that time although they are much in evidence in later artwork..
As ever, it is hard to gauge the scale on some of the pictures of the station and it seems odd that Kelper, an unknown artist, should produce the commercial aquatints when more practised hands were available by this time. Perhaps the most significant outcome is a reminder that this area of Liverpool was already developed by this time but that its appearance would change radically as the station became a major gateway to the city.